Anything Good In ‘The Con’? A new website for the sports fan who demands more. 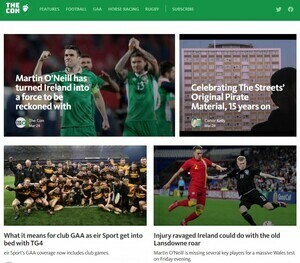 TheCon.ie is a new Irish website dedicated to sport and culture topics, aiming to deliver unique, interesting and high quality written content to the Irish online readership. In a world of clickbait this is a welcome addition to the realm of Irish sports coverage and beyond. We realise there’s more to the modern Irish sports fan so you’ll also find stuff on politics, music, film and TV and hopefully more in the future. We’ are accepting all sorts of contributions and content from people, just read our opening salvo and send us a mail editor@thecon.ie…. Posted in Misc and tagged TheCon.ie at 12:21 pm on March 24, 2017 by Broadsheet. Will I get paid? No. NOT YET. This is a labour of love and we’re making it clear with everyone that all work is sadly voluntary. I’m building a business on the back of your free labour. I would’ve thought the sports news market in Ireland was pretty saturated, but good luck with it all the same. Do we need another website telling us about horse racing and the premier league on top of all the newspapers, Joe.ie, & the42.ie? Perhaps a sport website that focussed on lesser covered Irish successes like Cricket & Hockey would actually add something to the conversation. wasn’t there another ‘sports news but different’ site promoted here a while back? So it can tell you only the news you want to hear? thecon.ie doesnt seem to exist. i cant find it online. maybe it is a con. Its a saturated market the sports banter website lark. Original Pirate Material was FIFTEEN YEARS AGO?!?! could give a fupp about sport but if it was all league of Ireland rather than Britain’s diving millionaires I might nod the head in respect.